Listing: terrace of 6 almshouses. c.1850. For Henry Rogers. Jacobean style. 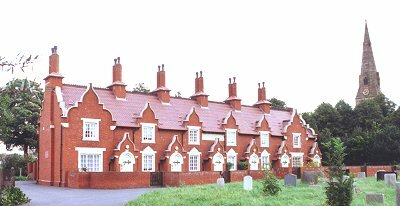 Awards: The Civic Trust gave the restoration of the almshouses a Special Mention in 1996. Their report says: "This derelict terrace of grade II listed, 19th century almshouses has been converted to one bedroom houses for elderly people. The deterioration of the existing building fabric made restoration impossible, and the terrace has been almost completely rebuilt. However, the quality of the reconstruction is above average. The building has retained its listed status amd now makes a beneficial contribution to its surroundings." The architect for the work was S. T. Walker & Partners; project architects Paul Burley, David Warren; quantity surveyor, Francis Graves; structural engineer, Peter J. Taylor & Associates; contractor, Baldwin Construction. 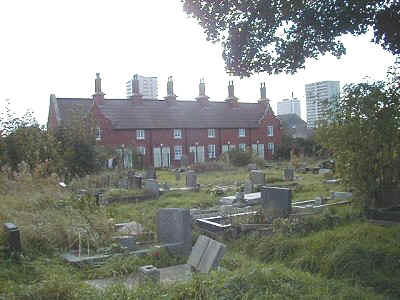 Comment: These almshouses are situated in the graveyard of Holy Trinity Church (seen to the right) and were built in 1850 by the benevolent industrialist, Henry Rogers. He gave each occupant an allowance of four shillings per week, along with clothing and coal for heating. He also provided furniture and kept the houses in good repair. They are now owned by the Holy Trinity Heath Town Charity. 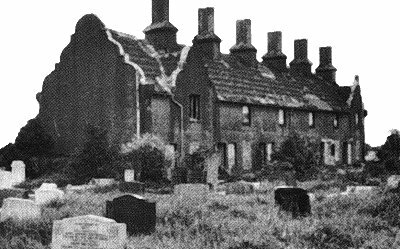 This picture shows the back of the houses in the early 1980's when they had been derelict for some time. They remained unoccupied for several years and at this time had an uncertain future. The same scene today. The houses were restored to their former glory in 1996. They are now once again fully occupied.